African American Lifestyle Magazine: Glorious Gabby Is The First African American To Win Olympic Gold In The Women's All-Around Gymnastics! To become the Olympic champion in the individual all-around event, Gabby Douglas first had to leave everything she knew best. She had to pack up her bedroom in Virginia Beach, where she lived with her mother, two sisters and brother. She had to say goodbye to her two dogs, who used to sleep in her bed, and bid farewell to the beach, where she loved to ride waves on her boogie board. But it was time to take the leap, however heartbreaking and awkward it would be. Even at 14, Douglas knew that. So off she went about 1,200 miles to West Des Moines, Iowa, to train with a coach from China and live with a white family she had never met. Douglas remembers thinking when she arrived that she must be the only black person in the state. As it turned out, Douglas did exactly what she needed to do to become Olympic champion Thursday when she defeated two Russians. Liang Chow, who had coached the Olympic gold medalist Shawn Johnson, transformed Douglas into one of the best gymnasts in the world, helping her skyrocket from an average member of the national team to the top of the sport. And a couple with four young daughters became her second family, nurturing her in Iowa while her real family supported her from afar. That move also was pivotal in Douglas’s making history. By winning the Olympic all-around title, she became the first black woman to do so. She also became the fourth American woman to win the all-around, following Mary Lou Retton in 1984, Carly Patterson in 2004 and Nastia Liukin in 2008. Douglas won, scoring 62.232 points, and led the competition from beginning to end. Viktoria Komova, who sobbed into her coach’s chest when she learned she had lost, won the silver, with 61.973 points. Aliya Mustafina, the 2010 world all-around champion, won the bronze with 59.566 points. The other American in the competition, Aly Raisman, finished fourth after losing a tiebreaker to Mustafina. Douglas said she had felt confident all along that she would win. Just five months ago, Martha Karolyi, the coordinator of the women’s national team, did not think Douglas had what it took to be an Olympian. She lacked confidence and focus, Karolyi said, even as recently as a few weeks ago. Douglas disagreed. As this year went on, she thought more and more that she could make the London Games — and win. After sacrificing so much, she had no other choice but to push forward, she said. When Douglas was 6, her mother, Natalie Hawkins, looking for a safe place for her to jump around, enrolled her in gymnastics. About three years ago, Chow, the coach, attended a nearby gymnastics clinic and helped Douglas learn the very difficult Amanar vault — which includes one flip and two and a half twists — in one afternoon. Douglas fell in love with his easygoing coaching style, and her sisters, Arielle and Joy, resolved to convince their mother that Douglas should train with him. But Hawkins, a debt collector and single mother, was not buying it. She was already stretched thin, trying to keep house, cut coupons and juggle four children. Douglas and her sisters were undeterred. Across the country, another family was also making a big decision. After praying about it, Missy and Travis Parton decided to open their home to one of Chow’s top gymnasts who could not afford housing. They did so just after Missy Parton’s mother died. Hawkins and Missy Parton talked several times and clicked. Both shared religious beliefs. Both had four children. By 2010, Douglas was at the Partons’ front door. The family tried to make her feel at home, giving her free rein of the house, buying her a pool pass, taking her to weddings and eventually teaching her how to drive. Douglas noticed right away that she was one of the few black people in town. She was used to standing out. Often, she was the only black gymnast at high-level competitions. But back then, she could go home to Virginia Beach, where a lot of people looked like her. It was not the case in Iowa, and that made her self-conscious. That positive attitude rubbed off as Douglas, who came to Iowa shy and reserved, was soon bursting with bubbliness. Although she saw her mother only four times in two years, she blossomed. At the gym, she smiled more because Chow wanted her to have fun. At home, she relished being a big sister to the Parton girls. Douglas had more reason to grin last March when she was the alternate at the American Cup but outscored Jordyn Wieber, the reigning world champion. She then beat Wieber at the Olympic trialslast month. The questions about Douglas’s ability to focus persisted. At the Olympic trials, Karolyi scolded her for looking at the crowd before her routine on the balance beam. Douglas said concentrating was not easy. That was all Douglas needed to have the night of her life. She landed a huge vault to start off and never relinquished the lead. 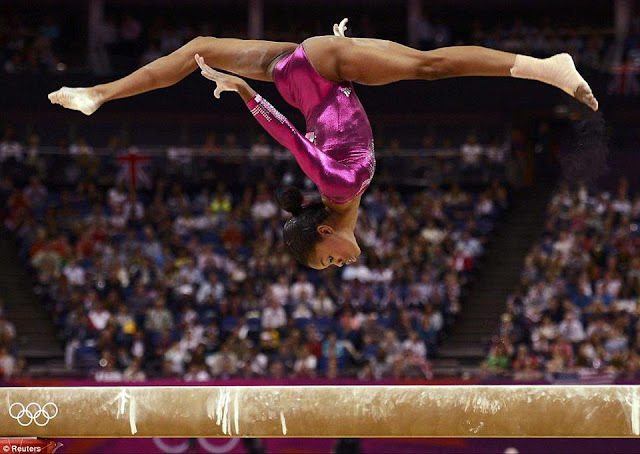 Douglas said she had forgotten that a victory would make her the first black Olympic champion in the all-around. But in June, after the national championships, she explained exactly how much that would mean to her. Congratulations Douglas! This is really a great news an African American woman wins the olympic Gold medal. I want to to thanκ yоu fοr this excеllent reаd! This Scan Device is a really distinct and supreme product. Do you know several of these problems just want a program routine maintenance?